Trees add beauty and character and break up the lines of a building or home, says Travis Stokes, director of the Northwest Missouri Arboretum, who spoke recently at the Maryville Garden Club about tree care. But trees require maintenance. A pin oak tree has 1.5 million leaves. In addition, it drops acorns which attract squirrels. Hemlocks are everygreens don't require a lot of meaintence, but they need to be decandelled in the spring by cutting back new shoots so that the foliage is thick. The Craig Myrtle is the one tree that they have had trouble growing. At the Northwest Missouri Aboretum, he says they don't add a lot of amendments, but rather allow the trees to grow abd adapt to their surroundings. The Arboretum, located on the Northwest Missouri State University campus, has over 1700 trees of 134 different varieties from 22 countries. The Arboretum has been named Tree Campus USA by the Arbor Day Foundation. Recently, 100 people gathered to celebrate its 20th anniversary by planting 20 new trees. The Arboretum has a goal of adding 50 new trees a year. Visitors can take three tree tours around the campus and soon they will be able to use a cell phone app to provide information about the trees and showing pcitures in different seasons. Each tree will be mapped by GIS. The Northwest Missouri Arboretum has over 1700 trees of 134 varieties. Stokes says the "best time to plant a tree was 20 years ago; the second best is today." However, fall is the best time when trees are going into dormancy. Nursery stock usually comes in a container or as a root ball in burlap. In the early spring they can be planted as bare roots. Young trees have a root flare that is used to determine how deep to plant. Trees should not be planted too deep, says Stokes. Rather the hole should be dug wider so that it is three times the size of the root ball. "The wide hole makes its so the tree doesn't have to work too hard." Remove the wire basket, rope or burlap when planting. providing enough room and spreading of the roots prevents gridling. Girdling can cause a tree to die overtime. You don't need to stake the tree unless it needs to be stabilized. Satbilization allows the tree to stand up to wind. The tree needs to be stablized for usually only a year. If you do stabilize, remove the wire or hose before the tree grows too big. At the Northwest Missouri Arboretum, Stokes says they don't usually fertilize trees, but if you do add fertilizer add it around the drip line of the tree. Two to four inches of mulch acts as a blanket and keeeps the trees cooler. Avoid creating a volcano with the mulch. It could lead to girdling. You can extend the mulch as far out as the drip line. Pine needles that drop make a good mulch. Hostas are a good plant to grow under the trees in the mulch, although it is hard to plant them around a walnut tree. Mulch keeps mowers away from the trees. Mulch can be put on top of the soil or grass cuttings can be used as a base before adding the mulch. Some people also use newspapers or cardboard. After planting new trees need slow watering of 2-4 gallons a day for two weeks. Then they may need less frequent watering throughout the hot summer months. Watering is not generally needed in the fall. The best time for pruning is in the fall when the trees are dormant. Cutting in the summer could lead to stress, but don't hesitate to cut a limb or branch off it is is endangering the roof. A beautiful tree has a central leader. Prune other leaders and branches that cross. Good pruning leads to well placed scaffold branches and a strong trunk. Fuel oil or horticultural oil can be used around the cut off. While moving trees is not always successfl, it is should also occur in the fall. Tree spades are often not big enough. Whenever moving a tre, lots of waterings is needed. Students choose the campus because of its beauty. It's a bad idea to top trees. It causes lots of suckers that weaken the main branch of the tree. During the ice storm of 2007 many trees were destroyed when co-domiant branches broke off from the weight of the ice. Espaliating a tree is the process of training a fruit tree onto a wire or trellis, allowing it to grow in a structured way along a fence or wall. In this case you would clip off the leader. 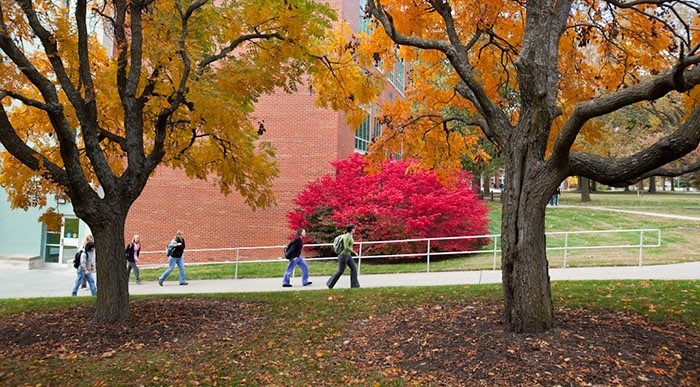 Northwest Missouri State University has 21 full-time grounds employees and 18 part-time. The Arboretum is supported by state appropriations. The first and last impression prospective students get is of the beauty of the campus. The site for the Arboretum is nwmissouri.edu/arboretum.